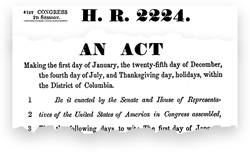 An act of Congress in 1941 was the actual event that adopted Thanksgiving Day a legal annual national holiday. Every observance before this time was based on traditions in the federal or state government body or by the people themselves. Here's the entire act from 1941 that adopted the legal holiday Thanksgiving Day. Notice that Thanksgiving Day is likened to the 4th of July and Christmas. Illustration 9: H.J. RES 41, Congressional act that set the 4th Thursday of November as Thanksgiving Day. Making the fourth Thursday in November a legal holiday. Resolved by the Senate and House of Representatives of the United States of America in Congress assembled, That the fourth Thursday of November in each year after the year 1941 be known as Thanksgiving Day, and is hearby made a legal public holiday to all intents and purposes and in the same manner as the 1st day of January, the 22nd day of February, the 30th day of May, the 4th day of July, the first Monday of September, the 11th day of November, and Christmas Day are now made by law public holidays. Passed the House of Representatives October 6, 1941. The history of Thanksgiving Day becomes splintered at points before 1941. It is a popular belief that President Lincoln started Thanksgiving Day, but he was simply the first President to proclaim a thanksgiving on the day requested by Sarah Hale for the purpose of a nationally unified day, this tradition survived until congress made it a national holiday. Sarah Hale does not give Lincoln credit for making it a national holiday. The reason for this is that the nation was split at the time due to the civil war and the southern states did not heed Lincoln's proclamation. Therefore, it was not nationally observed. Our late beloved and lamented President Lincoln recognized the truth of these ideas [A national Thanksgiving Day] as soon as they were presented to him. His reply to our appeal was a Proclamation, appointing the last Thursday in November, 1863, as the day of National Thanksgiving. But at that time, and also in November, 1864, he was not able to influence the States in rebellion, so that the festival was, necessarily, incomplete. President Johnson has a happier lot. His voice can reach all American citizens. From East to West, from North to South, the whole country will be moved at his bidding; at home or abroad, on sea or land, the appointed day will be welcomed as the seal of national peace and the harbinger of national blessings. Thus our own ideal of an AMERICAN THANKSGIVING FESTIVAL* will be realized, as we described it in 1860. The 30th of November, 1865, will bring the consummation. Mrs. Hale was still concerned about the establishment of the holiday a full three years after Lincoln's first Thanksgiving proclamation. Shall 1866 be the glorious year that establishes the custom forever, by the union now of every State and Territory on the 29th of November in this American National Thanksgiving? Again, three, four and five years later Mrs. Hale delivers an annual request of congress to declare Thanksgiving Day an official national holiday. At this point, the holiday is still not established. The Day needs only the sanction of Congress to become established as an American Holiday, not only in the Republic, but wherever Americans meet throughout the world. WHEN the last Thursday in November shall become, by special enactment of Congress, THE AMERICAN NATIONAL THANKSGIVING DAY, then the people of the United States will have three holidays, each one representing an idea not only of importance to our own citizens, but also of interest to the world. One of the last requests printed in Godey's Lady's Book is concerning Thanksgiving's need for an act of Congress. It describes the tenuous nature of the holiday's existence as an annual and national observance and also highlights the important role Mrs. Hale played in creating our modern Thanksgiving Day. Let us feel that our great Home Festival is no longer an anniversary whose celebration depends upon thirty-seven State governments, or even upon the yearly inclination of the Executive. Let us have the day which Washington consecrated by his selection set apart forever as a season of Thanksgiving for the mercies and blessings of the year. Let the Forty-fifth Congress, in the name of the American people, enact that from henceforward the last Thursday in November shall be observed, throughout the length and breadth of our land, as the day of our National Thanksgiving. Illustration 10: H.R. 2224 1870, adopts Independence Day, Christmas, New Years and Thanksgiving as national holidays. Thanksgiving was not yet given an annual date. The absolute indisputable beginnings of Thanksgiving Day as a legal annual national holiday are from 1941 when the US Congress adopted it by law. But there is still another issue to explain. In 1870, congress passed the law H.R. 22241. This is the law that adopted Christmas, New Years and the 4th of July as well as Thanksgiving. But the wording for Thanksgiving clarifies why it is not really an annual national holiday yet and needed the act of 1941 to solidify it's existence. The act of 1870, the first to recognize Thanksgiving as a legal holiday, did not set a specific date, as it did for Christmas, New Years and the 4th of July. But, just like these holidays, Thanksgiving had already been kept for hundreds of years before this, these acts of congress were only the legal adoptions of it. It's important to note that Congress made no distinctions between Christmas, New Years and Thanksgiving. So we should consider if the label of “legal holiday” has any real bearing on the validity of a holiday?